Accomplished Elvish warriors are sometimes called ‘Sárcan’, roughly meaning ‘one who has sacrificed in defense’ or ‘one transfigured by experience’. Often translated to ‘Elvish Heroes’ in the human tongue, this name does indicate some level of esteem and prestige, but is not used to glorify the position that these elves hold. Elvish Heroes are those who have survived numerous wars and have outlived many of their friends who fell in prior battles. They have seen all manner of atrocity committed by all races, be it orcs and humans ravaging the natural beauty of the forests, or even their own kind, other elves who are not above slaughtering innocent people out of pride and vengeance. Many years of fighting naturally make these swordsmen highly skilled in melee combat, but the hardships and destruction wrought by war take a great toll on both mind and body. 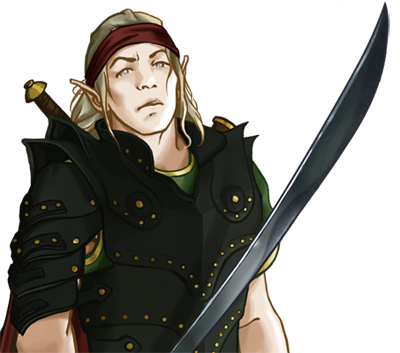 While the Elves realize the necessity of military strength and honor the ‘Sárcanet’ as heroes for their service, such a status is not one often sought after by the majority of Elvenkind. Last updated on Sat Apr 20 00:50:49 2019.